On the occasion of the 100th anniversary of its re-foundation in 1919, the University of Cologne offers the opportunity to reflect on the politics, relevance and impacts of the establishment of new universities in Europe during the 20th century. The international conference aims to compare conditions and intentions, forms and effects of new universities within changing political environments. While the European university model heavily relies on a tradition dating back to its medieval origins, it also proved to be flexible, innovative and open to the future. Thus, the question of the relationship between the establishment of new universities and contemporary social change is the main focus of interest: How were new institutions of higher education embedded in the specific social, political and economic environment of their time? And in particular: which ideas of the present and future of society fueled these founding projects? The conference will provide an opportunity for intensive discussion in a workshop-style atmosphere. The conference language is English. Interested guests may participate at their own expense. Since the number of places is limited, please register by e-mail by 20 March 2019 (gwamhof(at)uni-koeln.de). 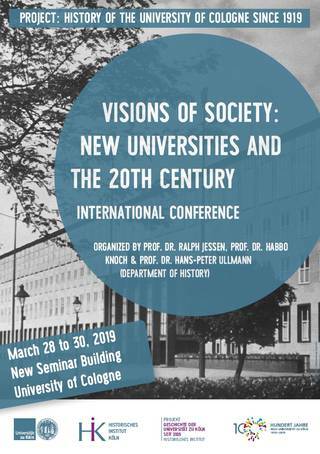 Organizers: Prof. Dr. Ralph Jessen, Prof. Dr. Habbo Knoch, Prof. Dr. Hans-Peter Ullmann (Department of History, University of Cologne).